Location: Island of Jersey, Great Britain. might have attacked the two hundred birds that I had there, in what was called the sanctuary. Well, it has been pulled down and cleared away, and I have already started preparing the area to encourage small wildlife to take over. Already we have moor hens, ducks and doves, red squirrels, pheasants and rabbits. Do you want to hold a fund raising event of some kind in the garden during 2016? Just keep it simple, contact me. All the Koi Carp have been caught and dispatched. The picture above was taken low down, just above the water. The latest on that is, I have found good homes for all the hundred and sixty Koi Carp. All we need is to start loading the pond with pond weed and lilies. The latest on the pond is that it has a very small annoying leak that that will be attended to as soon as we get around to it. To catch the last of the fish, we pumped the pond dry, catching them just before they grounded on the bottom of the pond. 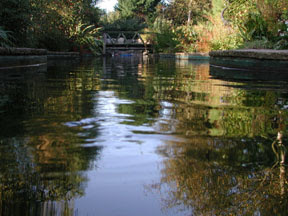 It's estimated that there had been well over half a ton of fish in the pond. News on the construction on the wildlife area. I will be pleased to take your surplus plant weed and gold fish from mid January. Busy week, or you could say a busy month. Cleared the pond of all the 180 Koi carp and had it cleaned out and at the same time I managed to find somewhere for all 100 birds.... The remainder of the 100 feet long aviary with its concrete floor has been pulled down and carted away. The steel cages have been moved, giving me space to create a series of shallow ponds to attract amphibian wildlife. It's as near to being childproof as I can make it and with two of the heavy-duty cages, we have made a hide overlooking the wildlife area and pond that can be reached by a flight of stairs. Children under six years old will have to be accompanied by a responsible person. .... All of that is 95% completed.... that just leaves us to work on what was the birdhouse, it's got to be good enough to be used as a classroom/shelter. . I would like to compile a list of companies/individuals willing to service / supply wedding fare in Reg's Garden. Paul we don't know how to thank you for the superb, brilliant, amazing, gorgeous shots of our wedding day... You have captured everything so magically, we couldn't have hoped for anything better... They really are stunning... You are very talented and we will treasure these along with our memories forever. Someone to machine sew on strips of Velcro on to long lengths of satin swags. Thank you, I have someone. A couple of local schools to use the newly created wildlife garden. I am offering an area of 150 ft x 30ft that will, in the future, include a structure 40ft x 10ft, that will be used as a classroom. Schools are being given an opportunity to create something special for the children's future. Parents, don't let your children's school miss this offer. I am pleased to say that the new band The Houndog Blues Band, under the direction of Malcolm Gateley rehearses in Reg's Garden Theatre at the weekends. Please advise me if I have left out your event. This must be the time of year when couples are starting to make their wedding arrangements. Let’s see what I can do to make your day something special. I don’t have a price list…. I just want to keep things simple. I offer the use of the garden, the amphitheatre and the covered stage, free of charge. The stage is the area that is used for the ceremony (agreed with the registrar) And I only ask for £25 towards the Registrar’s license. Optional: Use of the BBQ would be £50 to include gas, and after use cleaning. The BBQ can cook for up to 100 persons. I am planning to have a part time chef… he would be paid by the hour. All arrangements are your responsibility … I will help if I can. All garden events including weddings will close at 9.30pm (nearby are a nursing home and a sheltered housing estate) which means that all music must be kept at a low level. Do you want to give me a call 743756 or better still come and see what I will be offering you. I would look forward to meeting you if you want more information. p.s. Got any date in mind? p.p.s We have had weddings with over 90 guests … no problem. We do have a collecting box that you or your guests might like to put something in. It’s for all 'Children in Need', and it’s not obligatory. Many of the pictures on this page will expand if you click on them (recommended) . Father Christmas is visiting Reg's Garden! Father Christmas will be visiting Reg's Garden in St Brelade this year and will be talking to children about what they would like for Christmas. If he finds that they have been well behaved this year, they might get a present! The children will be able to choose something from one of the "Lucky Dips". Only children between the ages 3 to 10 will receive a present. An adult must accompany children at all times. Father Christmas is visiting every Sunday from the 17th November to 22nd December.... Also, on Thursdays 12th December and 19th…. Between 3.30 and 5.30pm. The Grotto can be found, on the right, just inside of the entrance to the garden, right next to the car park, for convenience sake. Before the children talk to Father Christmas, the adult with them will be asked to donate £2, if they are aged between 3 and 8 and £3 between 8 and 10. We hope you can all make it, everyone is welcome! Getting married in the garden is proving very popular. It was only last May when I was granted permission to hold civil weddings on the covered stage. We had two wonderful weddings and a Pagen wedding blessing during the summer. As I write, I have just had two enquiries for weddings, in one day is quite something, I think that I will have to knock up some kind of wedding arrangement details to follow. Loinel and Bronwyn's family and friends had created a wonderful setting for their wedding. Loinel and Bronwyn's friends and family decorated the stage. with children in mind. Nowadays, Reg’s Garden has become more of an adventure, with all the newly planted bushes to attract birds and butterflies and anything else that happens to be living in the garden. The newly installed hides will be a huge attraction, particularly the one at the top of the stairs overlooking the wildlife area and the ponds. Reg is making major alterations for 2013; he has decided to find good homes for all the large fish and all the birds. Instead the hundred and eighty feet long pond with the magnificent waterfall will be stocked with pond plants and a few goldfish. Reg felt that he would never be able to show off his Koi Carp to their best advantage because the pond water always looked so dirty, and the fish would eat all the vegetation. The main reason that he has moved the birds on is that more recently he has been asked by children more so than adults to move the birds away because they did not want to see them in cages any more. Hopefully visitors to the garden will see squirrels running along the newly installed, fifty metre long rope, and another interesting feature will be the shallow ponds that will be home to toads and anything else that would like to move in. The birdhouse is being converted into a classroom / shelter and the fairy garden will have more fairies around. The amphitheatre and stage has proved to be a great attraction for charity fund raising and Reg held thirty events in it last summer, including three weddings. It is the amphitheatre, which has been licensed to hold weddings with the ceremony itself taking place in a covered theatre opening off the amphitheatre. The covered theatre can accommodate up to 50 guests while a further 240 can it in the amphitheatre, which was built five years ago and has hosted concerts. After the ceremony, couples can make the most of the beautiful grounds as the setting for their reception with a semi-open dining area that can seat 100 people. The garden has BBQ facilities and would also make a lovely backdrop for picnics. There are also on-site cooking facilities if required. Couples are welcome to have music, either in the form of a choir or live band. Reg's Garden covers 1.5 acres. Plants have been carefully chosen, not just for their appearance but also for their fragrance and attraction to wildlife. A lovely place to sit and pass away a few hours in a relaxing landscaped garden. The garden has won the Jersey Tourism Silver Bowl major award for several years for the best 'Open Garden'. Except for the hide in the wildlife area with the staircase, the garden is wheelchair friendly. Loads of car parking and toilets including a less-able one. The garden is open every day of the year and entry is free.